This barn conversion sits in quiet surroundings just a stone’s throw from the The Cleveland Way. Situated at the top of Sutton Bank, on a working beef and cattle farm, this cosy semi-detached cottage is surrounded by far reaching countryside views. Created from former farm buildings, the cottage stands adjacent to the owners farmhouse and it borders the remnants of the old Hambleton Racecourse, which is now used by the local racehorse trainers to train the up and coming stars of today’s racing world. The Byre provides a perfect base for walkers, cyclists and riders. There are numerous footpaths from the doorstep and the Cleveland Way is close by, and cycle hire and designated trails for all capabilities are available from the Sutton Bank centre and horse livery is available by arrangement with the owners. Visit the Gliding Club at the top of the bank for a trial lesson and soar above the famous White Horse, or try some clay shooting and off road driving at Yorkshire Outdoors in Felixkirk. Close by is the market town of Thirsk, renowned for connections with the famous vet, James Herriot, and there are numerous village inns serving local produce and traditional ales. Visit stately homes at Castle Howard and Nunnington Hall, abbey ruins at Rievaulx and Byland, and the World Heritage Site at Fountains Abbey. Explore the Yorkshire Dales and the Moors, take a trip on the steam train from Pickering to the fishing port of Whitby or spend a day in the ancient walled city of York, 24 miles. Enjoy a day at the races, available in Thirsk, Ripon and York. Shop 4 miles, pub and restaurant 1½ miles. 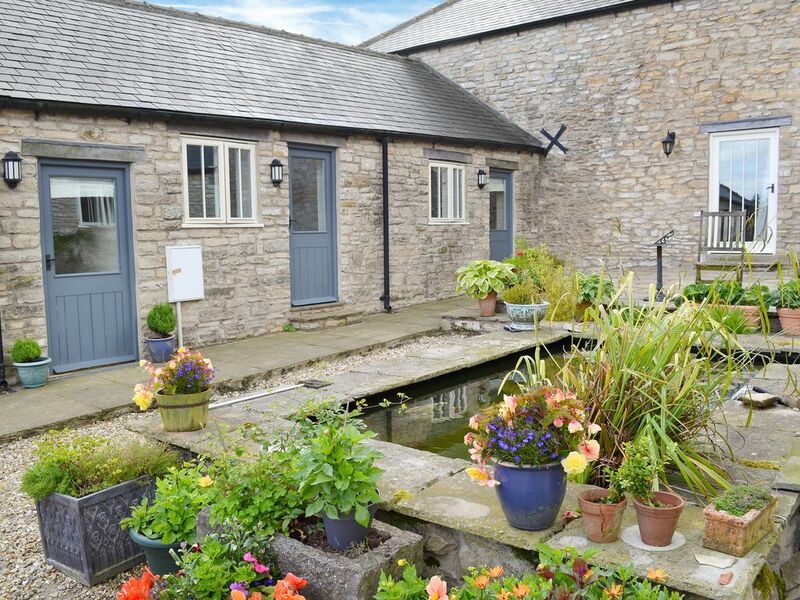 The Byre can be booked together with Garbutt Cottage (CC233101) to accommodate up to 4 guests. Living area: With electric wood burner, Freeview TV, DVD player and single sofa bed (for flexible sleeping arrangements). Ground source underfloor central heating, electricity, bed linen, towels and Wi-Fi included. Highchair available on request. Shared laundry room with washing machine and tumble dryer. Shared sitting-out area with garden furniture. Livery available on request. Bike store. Private parking for 1 car. No smoking. Please note: There is an unfenced pond in the garden. ADDITIONAL INFORMATION - Sofa bed for alternative sleeping only. This property has a no smoking policy in place.ADDITIONAL INFORMATION for both properties - Highchair available on request. Wi-Fi is available, however this facility cannot be guaranteed to be available at all times due to the unpredictability of Service Providers. Shared laundry room with washing machine and tumble dryer. IMPORTANT INFORMATION for both properties - There is a pond 6 feet away in the garden, care to be taken with young children. Limited mobile signal.